A black-capped chickadee waits for an opportunity to feed at the sunflower fines feeder being used by American goldfinches. In the background a red-winged blackbird enjoys a seed mix at the hopper feeder. The feeders have only been up for a week, but already I have bird feeding fever! Though we always had a bird feeder in my parent’s house growing up, this is the first home I’ve lived in as an adult that has allowed me to have feeders of my own. Aaron and I are really enjoying the experience. The first thing we do when we wake up in the morning is peek out the window on the north side to see who is already up and eating breakfast. In the evenings, I can’t stop myself from fussing with the feeders before I head in for the night, making sure the seeds aren’t stuck in the tubes, scattering some seed on the ground for the pheasants and mourning doves, seeing who I can surprise as I approach. The species are what you expect this time of year, black-capped chickadees, American goldfinches, American tree sparrows, mourning doves, a pair of Northern cardinals, and a skittish hairy woodpecker. One species I didn’t expect was the opossum that was buried snout first in the large hopper feeder Tuesday evening. He has adopted a nearby former woodchuck hole as his winter home, and I couldn’t be more pleased to have the opportunity to observe him (and hopefully keep him well fed) over the coming months. I hope your winter bird feeder will provide you with your own surprises and delights this winter! Goldfinches squabble over a spot at the sunflower fines feeder, while in the background, a red-winged blackbird enjoys a seed mix. American goldfinches at one of Mark and Sue’s feeders. HOW TO CREATE A SUCCESSFUL WINTER BIRD FEEDING SEASON? Put out feeders with good size capacity: And/or use multiple feeders to provide ample food especially during snow and ice storms. Provide nutritious winter seed foods: For most birds theses often include seed mixes of: black oil sunflower seed, sunflower chips, cracked corn, and white millet seed. Avoid mixes that contain milo, wheat, and other fillers. Keep your feeders full: Winter birds need to stock up on calories especially for those long, cold winter nights. Be consistent and keep feeding through the winter: Birds grow accustomed to your feeders especially in severe weather when the snacks you offer may mean their very survival. If you leave home for an extended period, try to have a neighbor or friend keep the feeders going. Remember water: Birds can become dehydrated in winter even if surrounded by ice and snow. Putting out a pan of water near the feeder on warmer days is a terrific idea. Stamp down the snow below: Ground-feeding birds such as dark-eyed juncos, doves and many sparrows will be able to gather up the seed that drop from the feeders if they don’t have deep snow to try to manage. Hang feeders in cat-safe locations: Place bird feeders in locations that do not also offer hiding places for sneak-attacks by cats and other predators. Think of placing the feeders ten to twelve feet from shrubs or brush piles. This gives the birds some time to react. Remember feeder cleanliness: Your feeders can get a little grimy. Because natural food sources are scarcer in the winter, more birds may be attracted to backyard feeders and those feeders will need to be cleaned with some hot water and bleach dried a few times during the season. Save some money and stock up on seed: Bird feeding veterans say it is best to stock up on birdseed in the Fall when many lawn and garden centers are discounting it to make way for winter merchandise. Stored properly, (in cool dry places and protected from mice) seed can easily last for months, particularly seed mixes and sunflower seeds. 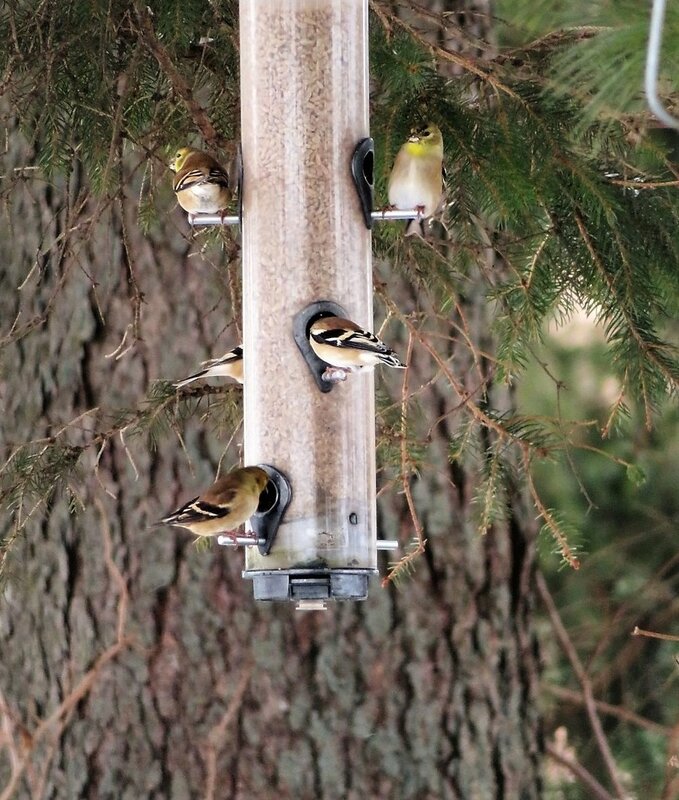 The first days or winter are a great time to start feeding birds. Once you have bird feeders, some water sources, some shrubs and trees for habitat cover you are well on your way to qualifying for certification as a backyard habitat with 135,000 other U.S. residents. Learn more about NWF’s Certified Wildlife Habitat™ program and see if you might like to join up. The winter birds surely need you. A mourning dove guards the hopper feeder. A mourning dove pecks through the shell corn we threw out for the rabbits. We have a seven-acre food plot at Goose Pond that is dominated by sunflowers, sorghum (milo), buckwheat, and weed seeds. A couple days ago I saw a flock of over 100 American goldfinches feeding on the sunflower seeds. Birds have been using the food plot since September and there appears to be plenty of seed remaining. It will be interesting to see if birds are attracted to feeders at the two MAS residences or instead feed solely in the food plot. I hope your winter bird feeders will provide you with your own surprises and delights this winter!